Discover 50% And More Off Selected Groceries at Tesco Groceries Find some fab bargains this week at Tesco Groceries! Find 50% Off Selected Easter Eggs at Tesco Groceries Now is the time to get some Easter Eggs! You can save 50% on selected chocolate at Tesco Groceries. 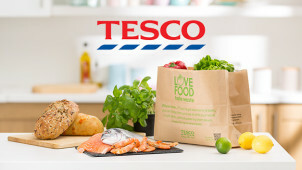 Free Selected Next Day Click and Collect at Tesco Groceries Get all your Tesco Groceries at a time that suits you and you don't need to pay extra with this great offer. 3 for £10 on Large Easter Eggs at Tesco Groceries Get ready for Easter with Tesco Groceries! Check out their vast selection available today. Buy 1 Get 1 Free on Selected Orders at Tesco Groceries Discover great buy one get one free deals at Tesco Groceries. Enjoy £5 And More Off Selected Gin, Whiskey, and Vodka at Tesco Groceries From Gordons to Russian Standard, make sure you save on your spirits by shopping at Tesco Groceries. 3 for £10 on Selected Meat and Fish at Tesco Groceries Stock up for the week with 3 for £10 on meat and fish at Tesco Groceries. 50% Off Selected Meat Joints at Tesco Groceries - Perfect for an Easter Roast Cook the perfect roast for friends and family this Easter and save 50% on the joint. Cupboard Must-Haves from £1 at Tesco Groceries Fill your cupboard for less, with must-haves from as little as £1 at Tesco Groceries. 2 for £2.50 on Selected Chinese Stir Fry Ingredients at Tesco Groceries Cook up a storm in the kitchen with a delicious stir fry! Head to Tesco Groceries and take advantage of this great price on all the ingredients you need. Save 50% Off Selected Battery and Electric Toothbrushes at Tesco Groceries Dentists agree that electric toothbrushes are the more effective way to keep your teeth and gums healthy. Find 50% off at Tesco Groceries. Selected Fruit and Vegetables from 49p at Tesco Groceries Making sure you're getting your 5-a-day is cheap and easy at Tesco Groceries! Check Out the Multi-Buy Savers at Tesco Groceries Stock up on your essentials for less with fantastic multi-buy deals available at Tesco Groceries. Baby Essentials from 35p at Tesco Groceries - Food, Bathing and More With Tesco Groceries, you can find everything you need in one place at amazing prices. Tesco originally started out as a market stall in 1919, and has grown from these humble beginnings in under a century to become the third largest retailer in the world – with stores in 12 countries around the world. Despite a global presence, it is best known as a British brand, and is the supermarket of choice for many people in the UK thanks to its good prices, convenient locations, and great additional services like its banking and mobile phone services. If you like saving money and shopping at Tesco, then it pays to register with vouchercloud and to add them to your watched brands. Tesco stocks all kinds of products from food, appliances and jewellery all the way through to wine and beverages, so you can make savings on everything you need! It's clear that you can make your money stretch further at Tesco, but especially if you sign up to the Tesco Clubcard scheme. You simply have to sign up, before collecting points every time your shop and you’ll be sent vouchers to redeem in-store or online! There are also tonnes of Clubcard Reward Partners to enjoy such as Pizza Express, Café Rouge, Goldsmiths and more. So if you’re thinking of taking a loved one out for dinner, or treating them to a piece of jewellery - you can use your Tesco voucher codes to save on your restaurant bill or lovely gift to help boost your buck. How do I use my Tesco vouchers? If you shop at Tesco, even if it isn't your main supermarket, it is still worth getting a Tesco Clubcard. This helps you save on all kinds of products with exclusive deals for Clubcard holders, and also allows you to get points whenever you shop that can allow you to save for free stuff over time. This can be a great way to get better value when you are buying your family's essentials. You can sign up in store or on the Tesco website. Does Tesco do free delivery? You can get your groceries delivered from just £3 a month, find out more here to see about free trials and more. Does Tesco offer Click & Collect? With over 320 Click & Collect locations around the UK too, you can order and pick up your shopping when it’s convenient for you. Choose your own delivery slot to make your weekly food shop hassle free - this can be another perfect money saving option with Tesco. Does Tesco do refunds on promotions? Refunds for items bought with a promo code will be based on the terms of their offer price - do check here for more details. Online delivery for groceries is available between 8am - 11pm on weekdays, between 8am - 10pm on Saturdays and between 10am - 10pm on Sundays. When you checkout you'll be able to choose a one-hour time slot in the daily operating hours. You can also reach Tesco online via the contact form on their help page. Tesco Opening Times vary pretty wildly - some are open 24-hours while others offer more typical times. Your best bet is to search for your local store online and check opening times online. Tesco is one of the UK's biggest and best-loved brands, and where millions of us buy our food and household products, as well as clothing, electricals and other goods, every single week. With Tesco, you can shop in supermarkets, smaller metro and express stores, or on the website of course, but however you choose to shop, you can make big savings when you use a Tesco voucher code from us. From everyday essential groceries through to beauty products, medicine, clothes and entertainment, Tesco makes quality and convenience affordable. When you register for Tesco online grocery shopping, you can get free delivery for the first month to help you get used to using the service and getting your groceries and household essentials delivered to your door. After the first month, fees for delivery vary depending on which slots you use and how much you spend, however get Delivery Saver plans that allow you to get access to free delivery 7 days a week longer term if you want. This can be a good investment if you do all your shopping online. When you order online at Tesco, you'll access the same great ranges of fresh produce as you do in-store, and the staff will carefully pick out the best fruit, vegetables, meat and fish to deliver to you at home. So when you’re stuck for time getting prepared for a big family meal, use a Tesco discount code from us to save on baked goods and sweet treats, quality meats, dairy products, fresh fruit and veg. With exotic and organic products available too, everything and more can be delivered to your door - fuss-free!